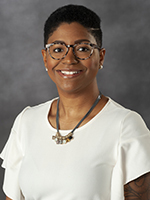 Raina L. Fields rejoined the University Public Affairs staff as internal communications director in July 2018. She coordinates strategic internal communications efforts to advance university priorities and initiatives. She was previously a member of the Public Affairs staff from 2014 to 2017, serving as social media strategist. She was responsible for coordinating social media related to the university president and other university-level social media platforms. Fields has specialties in public relations, marketing, issues and crisis management, social media and diversity and inclusion. She has led and supported higher education initiatives professionally as director of communications for the Division for Inclusive Excellence at VCU, director of marketing for the Department of Music at VCU, English faculty member at Reynolds Community College and marketing fellow at The Philadelphia Orchestra. Fields received her bachelor’s degree in writing and fine arts from Loyola University Maryland in 2008, her master’s degree in creative writing and English from Virginia Tech in 2012 and her master’s degree in strategic public relations from VCU’s Richard T. Robertson School of Media and Culture in 2015. Fields is a member of the Public Relations Society of America and earned her Accreditation in Public Relations in 2015.